Warts, those fleshly little bumps that mar the appearance of your skin are harmless, but hard to get rid of. They are skin growths born of a virus that attacks the top layer of your skin. This infection is the result of the human papillomavirus and spreads easily by direct contact with the wart. 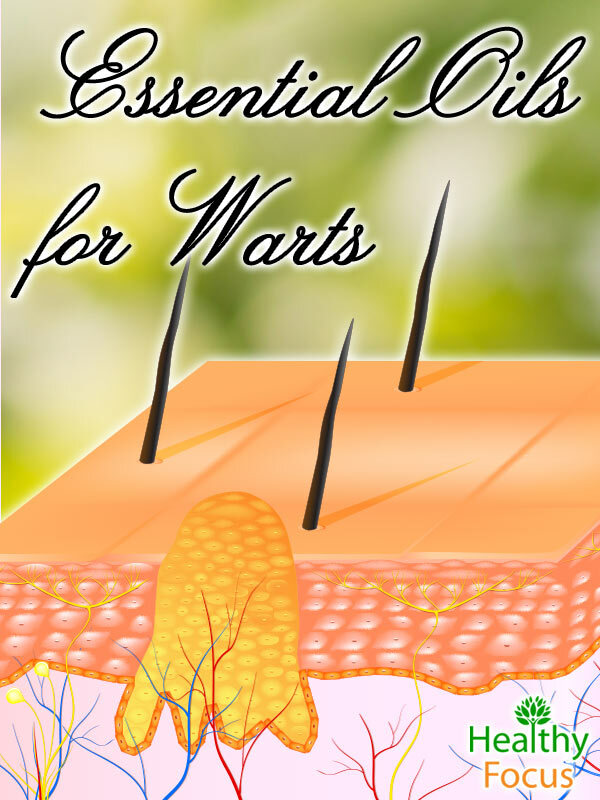 Warts are typically flesh-colored and have a rough texture. Some warts may also appear to be brown, smooth, or flat. Fortunately, there are all natural alternatives, such as essential oils, to treating this pesky skin virus. Warts are the result of the Human papilloma virus (HPV) and most commonly occur where the skin has been broken or scraped. Not all HPV is the same. There are about 100 different strains of HPV. The high-risk strain that can lead to cervical cancer is not the same as the low risk strain that causes plantar warts. These warts grow most commonly on the backs of hands, fingers, and near the nails. These warts most commonly appear where there has been slight trauma to the skin, where it has been broken from such habits as picking at hangnails or nail biting. These warts have a rough texture and may have a black dot that looks like a seed. These warts are extremely contagious, and infection can jump from your hands to your face via touch and nail biting. These are another common form of warts that appear on the soles of the feet. These warts are often flat and grow in clusters. Unlike common warts, these warts may be mildly painful and may feel like you have rocks in your shoe. These warts may also have the black, seed-like appearance in the center. Unlike common warts, flat warts have a flat, smooth appearance. These warts grow in vast numbers, often appearing twenty or more at a time. These warts may grow anywhere. Men have a tendency to grow them around the beard area while women more often grow them on their legs. For children, they most likely occur on the face. These quick growing warts protrude from the skin have a tubular, thread-like appearance. These warts are most commonly found on the face, growing around the mouth, nose, or eyes. Some of these wart have a seed-like appearance. The wart will have a black dot that resembles a seed. The “seed” is actually a blood vessel that has grown into the wart. There is no need to remove the seed. Warts can effect anyone. Some people are more susceptible to the HPV virus than others. These people are typically children, people with compromised immune systems, and people who bite their nails. Warts also have a tendency to appear where one shaves, such as the beard or legs. Warts may not only spread to different parts of your body, but may spread to other people as well. Someone may grow a wart after having contact with something someone else’s wart has touched, such as from bedding or a towel. There are many anti-viral essential oils that will not only eliminate the virus causing the wart, but will also decrease the likelihood of the infection being spread to other parts or your body or to other people. 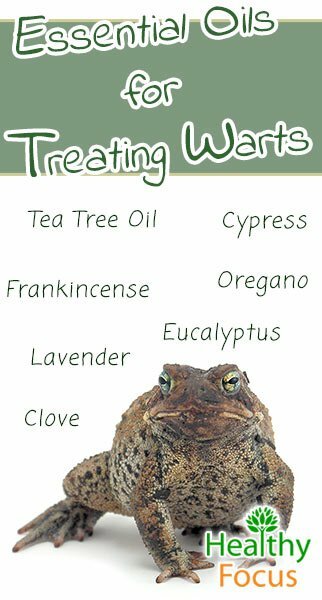 If you commonly suffer from warts, make sure to keep these essential oils handy to treat the virus in a 100% natural way. Tea tree essential oil has long been revered for its medicinal properties, not just in its native Australia, but in the United States as well. Tea tree oil is famous for its antiseptic, anti-inflammatory, anti-fungal, and antiviral properties, making it a staple of many medicine cabinets and first-aid kits. Apply a single drop of tea tree oil directly on the wart and cover with a clean bandage. Leave this bandage on overnight or for at least eight hours a day. Repeat these steps every day until your wart vanishes or falls off. This antiseptic oil has strong antiviral properties that eliminate infection. From the same botanical family as tea tree oil, clove essential oil has many of the same medicinal properties as its sister oil. Clove essential oil is also a known pain reliever, so if you have any pain associated with your wart, this healing essential oil should address that as well. To use clove essential oil in the treatment of your wart, place a drop directly on the infected area and cover with a clean bandage. Repeat this treatment every day until the wart falls off or disappears. Clove and tea tree oil may be too strong for sensitive skin and may cause irritation. If you have sensitive skin and want to prevent irritation, dilute the essential oils with a carrier oil. Keep in mind that the more you dilute the clove or tea tree essential oils, the less effective they are in terms of treating your wart. Eucalyptus essential oil is loaded with powerful healing properties such as antiviral and antiseptic agents. This healing oil kills off the virus while promoting the healing of skin and eliminating the potential for the spread of infection. Apply this essential oil daily and cover with a bandage. If you find tea tree oil to be too strong, you may want to consider lemon essential oil, which is just as effective, but more gentle. This antiseptic essential oil works as an antibacterial, an antiviral, and an astringent, effectively shrinking up the wart and killing off the virus. Apply a drop of lemon essential oil to the wart and cover up with a bandage. Apply lemon essential oil daily until the wart shrinks up. Be warned that lemon essential oil causes photosensitivity, so keep any part of the skin being treated out of direct sunlight. Lavender is quite possibly one of the most popular and commonly used essential oils and for good reason. This sweet smelling essential oil is effective in both aromatherapy and treating a wide array of illnesses and skin conditions. This antiseptic and anti-microbial oil is gentle enough to use daily while effectively killing the virus off of your skin. Apply a drop of lavender oil directly to the wart and cover up with a bandage every day. Frankincense essential oil is not only an antiseptic and anti-inflammatory essential oil, but it also works as an astringent, effective in shrinking up the wart. This gentle essential oil is used in treating many skin conditions and does not have any known side effects, making it nice for daily use. Apply frankincense essential oil to your wart every day and cover with a bandage. Stop treatment once the wart falls off or disappears. Cypress essential oil is another gentle alternative to treating warts. This antiseptic essential oil is also considered an astringent, great for expediting the healing process. Cypress essential oils works great on its own or can be a great addition to another gentle wart-healing essential oil such as lemon. Just like the above treatments, apply this essential oil directly to the wart and immediately cover up with a bandage to deprive the wart of oxygen. In addition to essential oils there are some home remedies that can be used in conjunction with oils. Keep Duct tape on for 6 days. 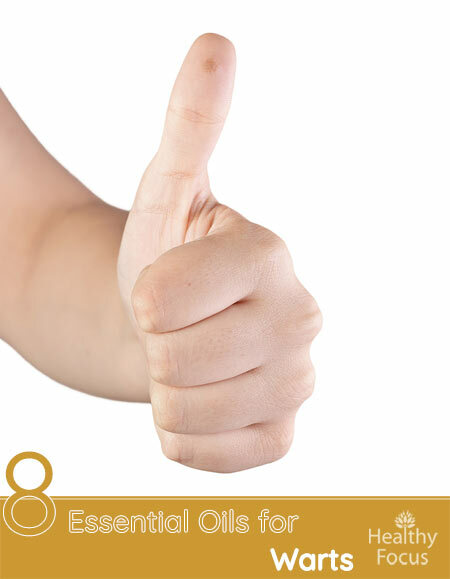 Remove the duct tape and then use an emery board or pumice stone to file down the wart. Repeat until wart is gone. There are conflicting studies concerning the effectiveness of duct tape. Some studies were done with clear “duct tape” and others with solid gray tape. If you were going to try duct tape, I would recommend using gray duct tape. The duct tape remedy has shown either to be the same as placebo or equivalent to using moleskin pads. It is best used in conjunction with essential oils. Using a piece of gauze or cotton ball with the essential oil and then using the duct tape to hold in place. One other home remedy that you can try if you are not squeamish is urine. You cannot beat the cost—some people swear that it works. A testimonial of someone using the urine treatment. Either place a piece of cotton ball or cut piece of gauze into the urine. Put the soaked cotton or gauze directly on the wart. Use duct tape to hold in place. Replace the cotton/gauze daily. Warts typically do disappear after a few months but they can last for years and even reappear. Trying to maintain a healthy immune system will help. Using essential oils can help but ultimately your immune system has to beat the virus and prevent it from reappearing. This is where probiotics can help. The best plan would be essential oils topically and to drink probiotics (at least) once daily.